Writing services are in great demand nowadays. The study process becomes much tougher and more stressful, students have to able to elaborate and learn huge amounts of information in order to become good professionals and meet the requirements of today’s globalized society. We are constantly examining the services, offered by custom writing companies and make our reviews in order to help people to understand which company is trustworthy and which is not. This time we have inspected the site Bid4papers.com, and here is what we have found out about their services. 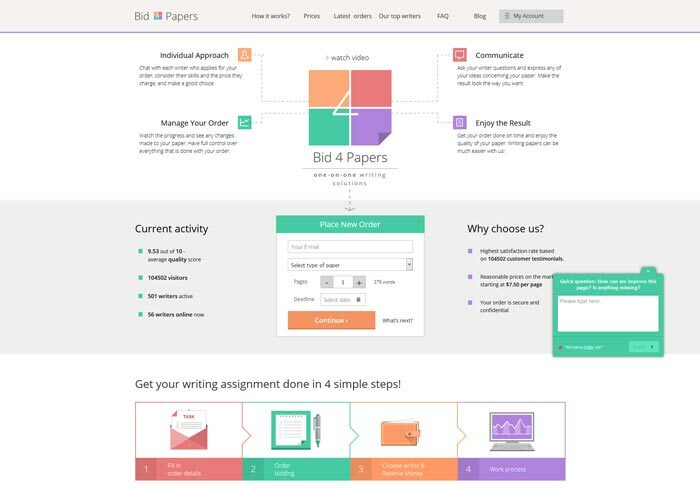 What Is Offered at Bid4papers.com? The first thing you notice while scrolling down the info about the services on this website is that it is pretty unusual. Here it is possible to order literally any paper you want. The question is if it will be completed or not, because the order placement process is quite strange. First you need to fill in a simple online form and indicate the type of your paper, deadline and some additional instructions. Then you wait until some writers start sending you their proposals. You communicate with them, decide on the price and choose the guy who will do your assignment. The process is unbelievably time consuming. In fact, it is very hard to understand with writer is better for your particular order. When you read the comments of other customers, you can learn that many writers produce very difficult texts that need to be rewritten afterwards, others work good only under customers’ pressure and some of them are simply rude. As you work directly with the writer, you do not feel protected from their bad attitude, comments and accusations of giving incomprehensible instructions, or requiring too much for the money that you pay. The company is located in Cyprus, and the majority of the writers are not native English speakers. This explains the high percentage of unsatisfied customers. In their comments many of them indicate such things as a big number of different grammatical mistakes, bad sentence structures, contradiction to the customer’s instructions, inability to correct the paper, task gaps in assignments etc. There are no fixed prices. The scheme is the following: you indicate your topic, paper type, discipline, deadline and the number of pages. The writers that are interested in your order calculate their prices and offer them to you. So the costs pretty much depend on your luck. The same story is with the discounts. It is like in the bazaar in Istanbul: if you manage to come to an agreement with your writer about the price-cut, you will get it. Otherwise, try to find a cheaper writer, but do not forget to check their rating before entrusting your paper to them. The money-back policy, however, is not that bad. You do not have to pay beforehand for the whole paper, but divide the sum in parts and pay to your writer in accordance with their writing progress. But be aware that once the whole sum is paid it cannot be refunded, so make sure to examine your paper carefully before paying for it. In our opinion, Bid4papers.com is not a professional and reliable service. The customers are not protected from the writers’ high-handedness, the pieces are not fixed and the quality of papers done by them is poor. The whole process of the bazaar-like bidding is quite exhausting. If you do not want to waste your time on unnecessary discussions, you had better contact other services, which will do all the managerial part by themselves with safer guarantees and for the same price.